The 2018 ADBSS Sheep Hunters’ Clinic will be held Saturday, September 29, 2018 from 7:30 am-Noon at the Tempe Mission Palms Hotel and Convention Center 60 E 5th St, Tempe, AZ 85281. Registration starts at 7:00 am with coffee and pastries. The clinic is provided free-of-charge. The clinic is specifically designed for those who have drawn a sheep permit for 2018 but please feel free to bring any friends who will be helping on the hunt. Some of the topics covered will include sheep hunting techniques, how to identify a trophy ram, equipment and optics, photographing the hunt, and field care of your ram. In addition to the presentations, representatives from all of the Arizona Game and Fish Department regions, the KOFA and Cabeza Prieta National Wildlife Refuges, the Lake Mead National Recreation Area, and the Bureau of Land Management will be at the clinic to give some specific information on a particular hunt unit. Email admin@adbss.org to make a reservation. Put CLINIC in the subject line, and include your name, daytime phone, and the number of people in your party. If you have drawn a tag, we encourage you to join the Society. As a member, you will receive our quarterly newsletter, the Ram’s Horn, you will receive mailings about water and habitat improvement projects, and you will be included on our email list. You will also be eligible to receive a plaque commemorating your sheep hunt at next year’s Ram Recognition Banquet. Our banquet honors those hunters who took rams during the 2017 season, and is an excellent chance for you and your family to see outstanding rams displayed in a collective group. Hunters are able to recognize their guides, taxidermists, and others who assisted on the hunt. Recognition plaques are awarded to all successful hunters who were members of Society at the start of the hunt season and who returned the advance notice hunter award form. Tickets are $60.00 per person, paid in advance. You may reserve a table of 10 with one payment of $600. Absolutely no tickets will be sold at the door! Deadline for reservations is September 24, 2018.. No-shows will be billed unless cancellations are received by September 24, 2018.. If you purchase multiple tickets, you must include the names of the persons who are attending in the “ATTENDEES” area. Tickets will not be mailed, but registration will be checked at the door. Dress code is business-casual. 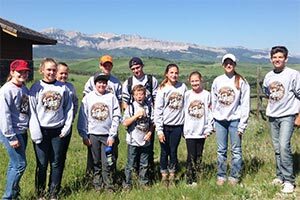 The ADBSS is currently sponsoring ten youths to attend the Wild Sheep Foundation/Boone & Crockett Outdoor Adventure Camp at Theodore Roosevelt Memorial Ranch in Montana this summer. Located about two hours from Great Falls, the TRM Ranch is at the Montana Rocky Mountain front. The Outdoor Adventure Camps teach young people outdoor skills, like shooting, fly-tying, and wildlife identification, as well as a greater appreciation for conservation and natural resources. The camp will afford these youths a unique opportunity to gain hands-on experience and knowledge in a natural setting. To select the ten deserving youths, we are conducting an essay contest on the theme: “Who benefits from a waterhole project, and why?” We invite all ADBSS members to encourage a youth they know, between 11-18 year of age, to enter our essay contest to be eligible for an all expense paid trip to the Outdoor Adventure Camp. The lucky winners of the essay contest will be provided with air transportation from Phoenix Sky Harbor Airport to Montana, ground transportation to the camp, and a return flight from Montana to Phoenix. ADBSS will also pay the camp registration fee, which includes equipment, supplies, meals and lodging at the camp.